Mitsubishi tests electric car in UK | What Car? European trials of the electric version of Mitsubishi's i city car will begin this month. 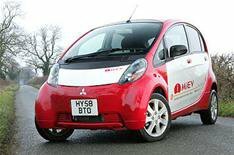 The Mitsubishi iMIEV is being trialled throughout Europe, ahead of going on sale next year. In total, 12 Mitsubishi iMIEVs will be tested in the UK, Holland, Norway and Spain. Users will include government departments, utility companies and company car fleets. The Mitsubishi iMIEV goes on sale in Japan this summer, and the UK was initially scheduled to get an early batch of 200 cars to put on sale late this year. However, with concerns growing over the fluctuating exchange rate with the yen pushing prices up, Mitsubishi accepts that buyers are unlikely to be rushing to purchase the car. Instead, it hopes to entice early adopters by offering the cars for lease at a price of around 750 a month. However, if you're not intent on saving the environment, you could get an Audi Q7 4.2 V8 or Porsche Cayenne 4.8 S for about the same monthly lease price.